This article appeared on Novara Media on 28th January 2016. 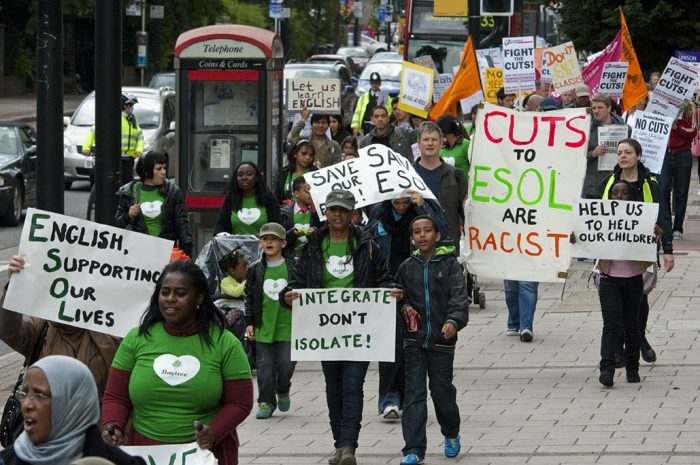 We are republishing it to highlight the impact of the brutal cuts to ESOL (English for Speakers of Other Languages) education funding since 2010 and their relationship to anti-migrant Tory policy. Alice Robson is a member of Hackney South and Shoreditch CLP, an activist with Action for ESOL, and a supporter of the Labour Campaign for Free Movement. After last week’s liberal appeal to Muslim ‘integration’, David Cameron’s recent “bunch of migrants” jibe shows what the prime minister really thinks of those who want to settle in the UK. Dermot Bryers and Alice Robson from the Action for ESOL campaign describe how years of cuts to English-language provision fit into the government’s draconian immigration rules. ‘Women must integrate, Cameron tells Muslims’ stated a headline on the front page of The Timeslast week. The PR king was attempting to pass himself off as the great defender of ‘our liberal values’ in the face of the Muslim threat. Britain “cannot tolerate gender discrimination,” the prime minister proclaimed, displaying a passion for gender equality that he had previously kept well under wraps. Dig beneath the headlines a little and we discover that the Conservatives are threatening migrants on a spousal visa with deportation should they fail a language test after two and a half years. Just consider that for a moment. If you don’t attain a level that the government deems satisfactory in your second, third or fourth language – irrespective of your starting point or whatever else is going on in our life – you may be separated from your family, detained, forced onto an aeroplane and taken to another country thousands of miles from your home and family. And this in the name of ‘our liberal values’. This is the real story here, not ‘Muslim women must integrate’ or ‘£20m so the most vulnerable can learn English’. Some students and teachers welcomed the funding even if they rejected the discriminatory reasoning behind it. Isn’t it a good thing that David Cameron is finally recognising the importance of ESOL classes and matching the rhetoric with hard cash? Isn’t this what students and teachers have been fighting for through the Action for ESOL campaign over the last five years or so? This additional funding, however, must be viewed in the context of more or less ten years of cut after cut to adult education as a whole and ESOL courses specifically. Since 2010 ESOL has lost approximately £160m. The entire adult education budget was reduced by 24% only last year, so this ‘new’ funding should really be considered a partial U-turn on the most recent cuts. Among the first classes to go were the community outreach classes outside further education colleges; in schools, children’s centres, churches and mosques. These classes targeted the most isolated migrants. Another major impact of the cuts was the loss of free childcare to accompany these classes. Without free crèches, the vast majority of women with children under school age simply cannot participate. So when Cameron expresses his concern about Muslim women’s access to English classes we are right to treat it with scepticism. Even worse than the hypocrisy and policy incoherence was the connection Cameron made between Muslim women not speaking English and terrorism. Cameron told a story about a mythical young boy in Bradford who cannot communicate with his mum. The cultural disconnect this causes forces him to reject his western identity and embrace extremism. Why does Cameron assume the boy and the mother cannot speak to each other? Who does he think taught the boy to speak in the first place? English language proficiency, or lack thereof, and terrorism simply do not belong together. There is no evidence to support Cameron’s claim and nor does he even attempt to find any. If Cameron wants migrants to learn English he needs to reverse the cuts to ESOL. If he wants to address the inequality between men’s and women’s access to education, he needs to ensure ESOL classes are accessible to women, for example by providing crèches and running courses that fit around childcare responsibilities. The truth is Cameron wants to do neither of these things. His true purpose is to gain political capital for appearing to be tough on Muslims and to tighten his already draconian immigration rules. As we approach the EU referendum, we can expect to see this a lot more.